I hope you all had a blessed, family-filled Resurrection Day! Hope you all remembered the reason for the season - He has risen! I went a little Pinterest crazy and found some really neat Easter goodies to make! cream for the tail so I had to improvise! Dyed deviled eggs!! YUM! I love deviled eggs. I found this recipe & fell in love. peeps to use for the "fish" - so I used marshmallow instead! The "rice" is rice krispy treats and the "seaweed" is fruit roll-up! It was a hit at my family's - and V's family! A Thifty Mom had these up! They melted my heart. SO CUTE! Everyone loved these little guys, too! Besides the reason for the season and family time, I love being creative and having fun with food like this! What kind of goodies did you make for the holiday? Oh my gosh.... you are the CUTEST! These Easter treats look amazing! I'll have to do this next year! Those chicks are too cute! That last one is really cute. Love! The pancake bunny booty is just too cute! Love the little chick eggs too. Glad you had a fantastic Easter! I LOVE that you made the dyed deviled eggs AND the chick ones, like we talked about. When I got the text and pic of the chick eggs, I seriously had the biggest smile! So cute! I made a low cal strawberry swirl cheesecake that I plan on blogging about tomorrow. If you plan on doing a Tasty Tuesday, I'll definitely link it up! Love you! yummy treats!! thanks!! I think I gained 10 lbs! Love the blue eggs, that's a different spin on an old classic. I saw those chick deviled eggs and have to admit while they are cute they also kinda creep me out just a bit. I guess it comes from my fear that I will crack an egg and there will be a baby chicken inside of it instead of the egg yoke and white. I'm a little crazy though, haha! Happy Easter (a day late)! The little deviled egg chics are adorable :D I almost dyed my eggs for my deviled eggs too, but ran out of time! We also did an Apple Butter Pork Loin, Baked Beans, Yams, Scalloped Potatoes, and I threw together a few loaves of fresh bread :)For dessert it was Carrot Cake (of course!). Glad ya'll had a yummy day! 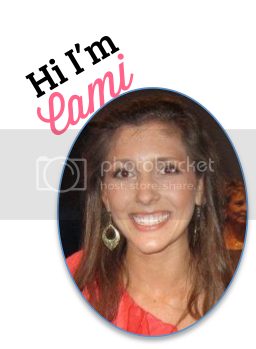 cami, i'm so happy to hear you had a wonderful Easter! omygoodness, i love all the treats you made! the deviled eggs are such a pretty blue, and those rice krispie treat sushi...ahhh, i love it! such sweet recipes from friends! Such cute ideas! John commented that deviled eggs was the one thing that we didn't have at our lunch.